LPTW’s 30th anniversary coincides with my 50th (in April). The received wisdom is that women don’t reveal their age, but in my part of the world, I once read a statistic that said on average, woman here don’t live past 40, so for me, it is something to celebrate. In times gone by, it was also a source of pride to grow older, as you could pass on your wisdom to a younger generation. I try to do this through the work I choose. Eleven years ago I began on this journey of full-time acting, followed some years later with writing, producing and more recently directing, mostly because I wanted my work to be more relevant to my environment. Even when I produce or perform the published works of others, it’s important to me that my audience can find themselves in the work and that the production asks meaningful questions. I began to write in 2001, and though I didn’t know it then the question I was interested in showed up in all my plays, which have become a trilogy of musical performances (in the sense that they include live performances of traditional African music), with dance and narration. The three “plays” deal with dreams and what happens when a dream is deferred, and more importantly what happens when you allow your dream to take shape within this lifetime; the fear and the elation. I’m celebrating my half centenary with a revival of some of my favourites. Beginning in November 2011 with Ariel Dorfman’s Death and the Maiden, the season includes some Alan Bennett, some short plays from the Humana Festival, some Margaret Edson, some Ntozake Shange. All this is subject to getting the rights, of course. The year will end with the third play in the trilogy mentioned above, They Call Me Wanjikũ, a semi-autobiographical journey. I join my fellow family members in the LPTW in celebrating 30 years of increased visibility and opportunities for women in theatre. Mubarikiwe (Blessings). Inside. Meditation is a good tool for tapping into one’s creativity and inspiration. Also current events and issues affecting society that resonate with me and would be good subjects for utilizing theatre as a tool for social change and entertainment. Long Walk to Freedom by Nelson Mandela/ Gandhi starring Ben Kingsley/ “I found God in myself and I loved HER fiercely,” from For Colored Girls Who Have Considered Suicide When the Rainbow is Enuf by Ntozake Shange and “Why didn’t I fight harder? Why didn’t I picket the White House, all by myself if nobody would come?” from The Normal Heart by Larry Kramer/ the CBS reality show, Survivor/ Wishful Thinking (a chocolate port). Master Harold… and the Boys on Broadway. By the end of the play, I was unable to move or speak. When the house lights came up in the theatre, I was weeping uncontrollably for some time. I sensed an usher hovering nearby who probably wanted to ask me to exit the theatre, but didn’t. Eventually, I collected myself and left, but I was changed. Athol Fugard’s play allowed me to see that it was possible to use theatre as an agent for social change and empowerment while still entertaining. His play directly affected the dramatist I was to become. It sounds cliché, but I too want to help create a better world, one ticket buyer at a time. Having my plays presented on stages around the country; giving an acceptance speech at the Tony Awards; taking a road-trip to see America. That racism, sexism and classism have worn me down (but not beaten me); and that I worry that I won’t see parity for women theatre artists, especially women theatre artists of color, in my lifetime. 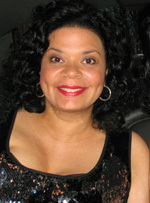 Yvette Heyliger National Black Theatre Festival Emerging Producer Award; Planet Connections Theatre Festivity’s Outstanding Play with Music Award for White House Wives: Operation Lysistrata! ; AUDELCO Recognition Awards for Excellence in Black Theatre’s August Wilson Playwright Award for What Would Jesus Do? ; What A Piece of Work Is Man! : Plays for Leading Women coming 2012.